If the pictures from Solange Knowles’ recent Pinterest-worthy nuptials tell us anything, it’s that weddings are no longer just about a white dress and a bouquet of tea roses. It’s the little things that make your special day unforgettable. Which is why LoversLand, a new bridal concept store on Toronto’s trendy Ossington strip, is stocked with the kind of curated finds that will take your wedding to Solange-like heights. From gorgeous gowns and ready-to-wear dresses to unique headpieces, wedding decor, gifts, lingerie, swimwear and leatherwear, LoversLand has all the specialty items a couple could want to make their wedding unique and customized. 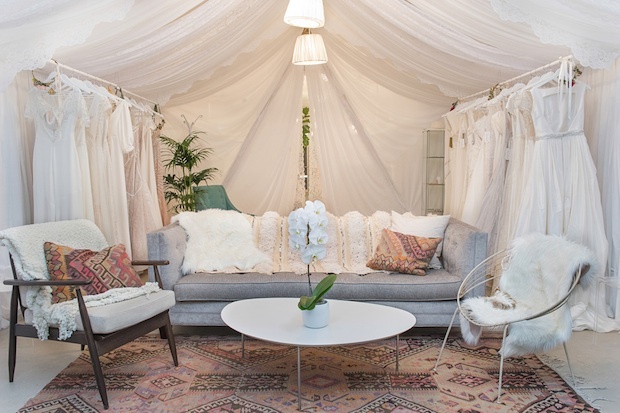 At the back of the shop resides The Haven, a dreamy, tented room decorated in soothing pastel tones where brides-to-be can have a private one-on-one dress fitting experience. Owned and operated by Yvonne Reidy, Danielle Gulic and Trish Spencer, who together have over 20 years of experience working in the fashion industry, LoversLand is the kind of casual yet curated concept store modern brides have been waiting for. “We’re really excited to welcome those who crave a laid back approach when shopping for weddings, honeymoons and special gifts,” Trish said in a statement. It sounds like something that would be right up Solange’s alley.